is the Barbaresco Bricco di Neive Riserva recipe according to the Rivetti family: expansive and aristocratic on the mouth, with extraordinary length and very refined tannins. A great wine for life’s big moments. If a serving suggestion is absolutely necessary, try uncorking it alongside a roast duck that has just ‘happened’ to swallow a little black truffle before being put in the oven. FERMENTATION: in steel for 10-12 days at a controlled temperature, with traditional pumping of the must over the cap. AGEING: 36 months in oak, with 80% in Slavonian casks holding 50 hl. and 20% in 225-litre barrels for the first 24 months, followed by blending and a further 12 months in casks of Slavonian oak. APPEARANCE: deep garnet red, taking on varietal orange hues with ageing. 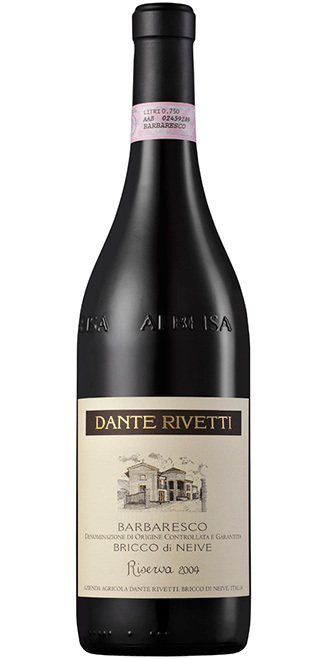 TASTE: dry and full-bodied, with tannins on entry and long, nicely tannic structure. PAIRINGS: red meat and game, medium mature cheeses.